1up.com reports that Google Chrome Web Store will be launched in October and online games will be one of its main attractions. "Set to launch this October, the store aims to make a proper marketplace for browser games -- one that solves a lot of the issues of games on the web today, from discovery to monetization." Google's game developer advocate, Mark DeLoura, thinks that it's difficult to find great online games, so Google Chrome Web Store tries to solve this problem by allowing users to rate games and write reviews. Chrome users will be able to install games, which adds shortcuts to the "new tab" page and grants additional permissions to the games. Not all games will be free, but Chrome users can buy games directly from the Web Store and pay using Google Checkout. Google's platform will support free trials and subscriptions, while developers will only pay a 5% processing fee for each transaction. 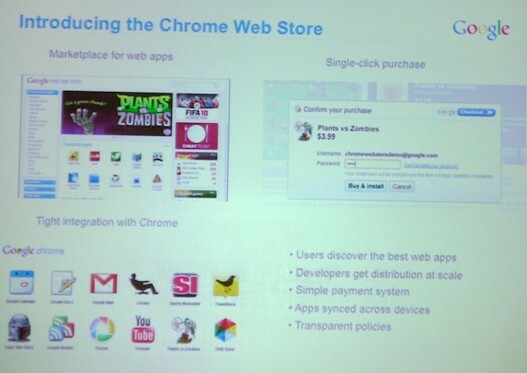 Will users pay for web apps in Chrome's store? More than half of the Android apps are free and paid Android apps are only available in 13 countries because of Google Checkout's limitations. Android Market doesn't make it easy to find interesting new applications and doesn't recommend other applications based on the ones you've installed. Hopefully, Chrome Web Store will do a much better job than the Android Market. "because of Google Checkout's limitations"
Untrue, I am in Ireland (not in the 13 countries) and I have a Google Checkout account that I am using to pay for Google Apps Premier and adwords. Also, by using MarketEnabler and fake a US provider, I am able to buy apps using my Google Checkout account with my Irish Visa card. I am not sure why Google is not opening Android Market paid apps to more countries but this is not because of Google Checkout. May sound a little odd but I'm curious as to where YouTube's reach will fit in. Yet I know videos compared to games - apple & oranges. Still YouTube reaches a young market. This is indeed great to know that Google is stepping into the field of gaming and online stores. It might be possible that Google could beat Microsoft. I think. More competition is definitely good for us the consumer, but this will hurt Steam's sales *slightly* and could really hurt the awesome Kongregate; however I'd really like to use this appstore. If people can buy online games then it might make it possible for devs to hire other devs to make more levels etc, while the main dev gets to work creating the next game, which they will hire another dev to work on once they complete the majority of the project. Hey, i don´t know if another More competition is definitely good for us the consumer. It´s google okay, but there are much fierce competition. Hmm... but I'm curious about it. I've been wondering how long this would take! It seems to be very interesting. I am waiting when it would be launched. It would be fun as it provides a lot of new features. This is indeed great to know that Google is stepping into the field of gaming and online stores. That's good news for a gamer like me. Chrome Web Store is looking great.Yesterday,I visited the chrome store and download the Chrome Angry Bird Game. This Chrome web store is amazing. I didn't know about it until this article but I just visited. Thanks for posting.